As holiday shopping season is approaching fast, we are very excited to announce **Quick Suggest, **a shopping assistant built right into Samsung Internet browser. Quick suggest is a smart assistant for your browser and your own personal shopper. It gets important info right when you need it while you browse. It suggests related articles, awesome offers, expert reviews to take your shopping to the next level. When you are searching for a product or shopping online on a retailer website, with one tap, Quick Suggest brings the best deals to you, to save you time and money, and to help you make smarter decisions. 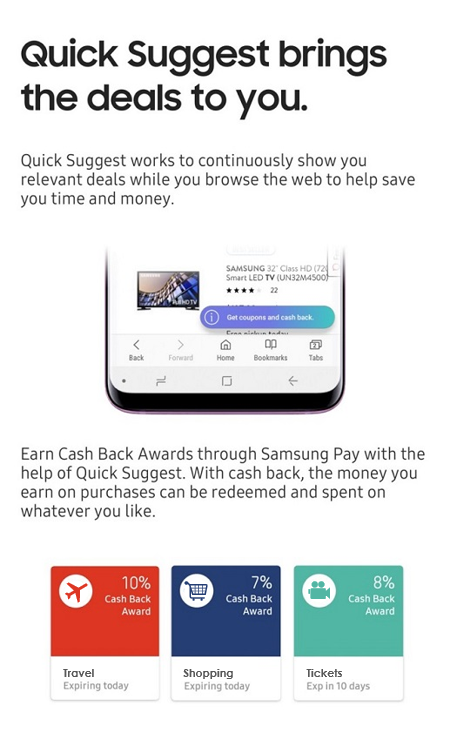 Quick Suggest brings you the same awesome cashback offers you can find on **Samsung Pay**, right to your browser, with just a tap. You’ll earn money for everything you buy from their online store or app during the promotional period. Once you’ve received the Cash Back, you can redeem it and use it to make purchases through Samsung Pay! It’s that simple! 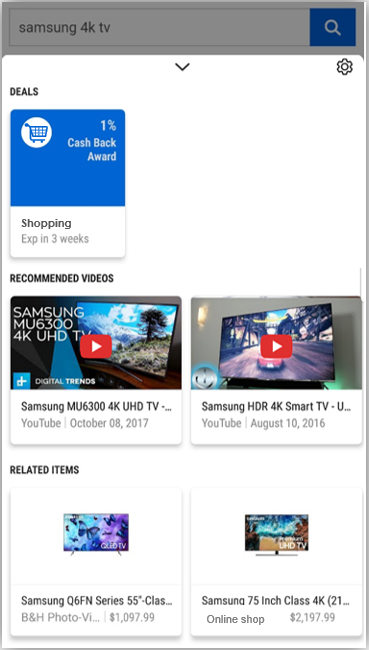 Along with cashback offers, when you tap on a Quick Suggest icon, you can see expert Youtube reviews, best deals (such as coupons and gift cards on sales), and even a better deal at another retailer! Samsung Internet -> Menu -> Extensions and enable Quick Suggest. You can learn more about Quick Suggest and cashback offers, follow this link. Cashback offers in Samsung Pay are powered by **Button**. You can grab latest version of Samsung Internet v7.4 to start saving with Quick Suggest. It is available only for our **users in US **and on Samsung Pay **eligible Samsung devices **only. By Mahesh Kulkarni on September 12, 2018.